Dan Oliver of Myrmikan Capital runs a highly successful small cap gold fund and his deep, historical understanding of money and gold’s inherent stability at the center of the capitalist financial system is fascinating in the context of today’s credit bubble. In this highly requested interview with Grant Williams, Dan also provides tremendous insight into the psychology of speculating in the junior gold mining space. Filmed on June 29, 2017, in New York. So impressed. Real vision has done it again. This should be in the top ten rv picks. This interview was released on my birthday! The part at 15:00 where he talks about Tacitus writing 33AD "Emperor Tiberius...100 million sesterces were to be taken from the imperial treasury and distributed among reliable bankers, to be loaned to the neediest debtors" .... goosebumps. Stuff is fascinating. People act like what happens in the present has never happened before - but its happened since the beginning of time and it happens over and over again! The most impressive back and forth about this global mess in relation to gold's role and history and the range of outcomes to conclude this can kicking that I have ever heard. Well done! How fantastically in-depth was that? Thank you. Precisely why i subscribe to RV. this interview stops short of any practical advise or tradable ideas. Have to put negative review this time unfortunately. "partners' of RVTV expect something better, more actionable, more hard data. The interview wtih Rhona O'Connel and their report is much much better quality and info! If you didn't get advice out of this I don't know what to say. It educated me on both the place of and timing to hold gold. Not everything has to be a boiled down call to action. Maybe the best "gold" interview I've heard on RV. I cannot believe I have not heard about Dan until now, but I will closely follow him going forward. Well done Grant! Great discussion. For me it is simply history, and the human condition. Your paper money is proven to depreciate and occasionally that rate of depreciation is very high, Once in a couple of generations it is catastrophic. Gold goes up and down and doesn't give you any interest, costs you to hold unless you do it at home, so why hold it? I read in a great little book called "SWAG" the following quote.......“Gold is a zero coupon , perpetual, irredeemable bond. With no credit risk. With no counterparty risk. Issued by God. That why I own it. In todays world everything else seems uncertain and there is so much debt, demographics in the West + Russia and Japan, is on the wrong path. So many promises have been made on pensions and social security. New nationalist threats are arising all the time. Whats wrong with having some gold as an alternative of real money? I have my price floor and we are not a million miles from it, but if i have to take a 10% loss I will gladly take it. The next bust will not be like the last one. At what point will investors and savers say "The FED tried and failed last time...I will not trust them again!" and look to hold some gold (and silver). Grant, I know you'll resist this but with all you do to speak of Gold. How about predicting a new top in gold price and likely time??? One of the most valuable aspects of real vision to me is the effort taken to speak with people that have their opinions on the big picture and where they operate within the scope. We're all so busy that it is easy to stray from the big direction shifts sometimes. Great interview. Grant great job! My only complaint is that this interview did not last longer. Definitely have Dan Oliver again. I heard him at a conference in New York over a year ago, and have read his monthly newsletter ever since. A good man, well spoken, with amazing knowledge and wisdom. What a fantastic interview. Another example that some of the smartest thinkers have a deep appreciation for history and are voracious readers. Good lessons for everyone. I've noticed in the last 6 interviews that one of the cameras being used to make the video has a very poor quality in regards to the picture. Can you RVTV guys fix this? I also notice that the over-the-shoulder shots capture too much of the adjacent person's head which somewhat obscures the frame and when someone scratches their head or adjusts their position by shifting into the camera's arc of view, the action completely obscures the viewer's view. Highly annoying... As for the interview, as usual, great stuff!! More, please. Excellent interview. Really enjoyed it. Dan Oliver addressed many of the concepts of the gold as money/commodity from beginning to end. This is one of the interviews where I want to read the transcript and apply some careful thought to many of the things said in this program. Thank you Grant for another home run. One of the best interviews yet, really enjoyed the interaction. How do you understand politics, government, or anything if you don’t understand this conversation? Excellent. I've worked in Gold mines, open pit & underground. I was waiting to hear a little about some win/loss stories of investing in gold mines. But I thought there is only about 20 years of global gold mining reserves to be mined out. But it was great to remember about the gold mine safety teams going around handing out safety slips to some employees. Negative Beta aspect of Gold for portfolio rebalancing is a big take away with this interview. really outside of gold as insurance against fiat currencies that is what gold does as investment. Very solid on the history and plumbing of what makes the gold mkt flow within the monetary system... just would like to have heard more on portfolio construction and which companies he might have passion for otherwise his best in class views on the gold price could just be traded in GDXJ? If this is Daniel Want, could you address all your excellent questions in a new interview /video? That would be hugely insightful! I meant this to be reply to Daniel Web below. He mentions Langone's question to Druckenmueller about a $1BB loss: What did you learn? D's reply: "Nothing." Well, sure i like the pyramids/China example --and all that history was entertaining, but i didn't learn anything new about buying/hold gold that i didn't already learn from other RV experts. I guess that's okay because the message to have some gold insurance is still a good one. Seemed like a long way to get there, though. Dan is only the second person I've heard compare China's build out to Pharaonic Egypt. The first was Anne Stevenson-Yang. Hopefully she'll grace these airwaves soon. Finally! Someone who understands our economic condition with the overlay of historical perspective. His most profound statement - "what we have today is not capitalism." Hear, hear. What we have today would be more appropriately called creditism, a term possibly coined by Richard Duncan, a man who understands the problem (but who, unfortunately, believes more debt is the solution). This system running on credit, or debt, rather than capital, or savings, is a marauding beast, a beast system that devours all but those who already posses leverageable assets. By continuing to support it we in the financial profession sow the seeds of our own demise, poison the well, cook the goose, tie the noose; whatever the metaphor, it's suicide. if anyone has created list of books he mentions on interview, it will be great. I admit I am a far less sophisticated investor than all the interview guests here. However, all the "gold experts" I have seen so far basically say that at one point in time it will be useful to own gold, however they do not know WHEN that is, for HOW LONG that will be, at what PRICE to get IN and at what price to get OUT. What does that tell us about "gold experts"? You may want to consult a fortune teller with a crystal ball if you want a road map of the future. If you're looking for answers of when to trade your fiat dollars for gold then you have missed the point of the entire interview. I agree with Daniel W. here that the experts speaking about gold are offering very poor trade advice, which is what I believe Daniel W. is after. If I were to generalize what they are saying it is that gold is not a trade, therefore their trade advice is poor by definition. It seems what they're saying is that you should have a min and max allocation to gold. The minimum is definitely not zero and, generally speaking, it appears we all should be moving our allocation upwards towards whatever that maximum is. Gold has never gone to zero and 1 oz still buys a mans suit! If this is Daniel Want, could you address/answer the excellent questions you pose via a new interview or video? That would be hugely insightful! Daniel, there's a big difference between an expert and someone who can tell the future (hint: the latter does not exist). Stop looking for fishes, start looking for fishing poles. I love this guy! Great interview. And he's gone a heck of a job quarterbacining the NY Giants as well. I enjoyed this thoroughly. 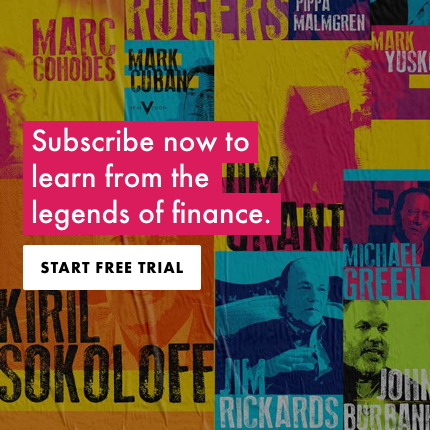 It would be very nice to see an interview with Mike Maloney, who has excellent grasp of what money truly is, and the understanding of money throughout history. Excellent insights on gold. I now have a totally different perspective. Wow. What an intellect. Encyclopedic knowledge, and a memory to match. And all distilled with great clarity and reason. Fascinating discussion. Look forward to hearing much more from Dan. VERY GOOD! For once I don't have a single critisicm ;^) I will say that I was a little bit put off by the the fact that Mr. Oliver actually spent part of his life making stuffed animals but... I was quickly won over by the amazingly coherent historical perspective he gave to his thesis. I opened an account with Myrmikan Gold several months ago and consider Dan the best writer that I follow. Ironically I heard about Dan on Real Vision TV from Paul Mylchreest & have really enjoyed reading Dan's articles. Thank you for a great interview guys and thank you Grant for making this happen. Grant great interview- "The barbarous relic" history won't judge Keynes well on that call. Crypto currencies are just another form of paper money. What are they backed by? Its backed my an ample supply of greater fools at present . Digital scarcity - what like the ability to fork and double the amount of available assets at the flick of a switch? Digital scarcity is an oxymoron. Fantastic interview - and this guy is brilliant. Super sharp and deep knowledge of history. Grant's engaging interviewing style on display beautifully here. Thoroughly enjoyed this one! I think in a sense that you can start by looking to yourself to answer that question. Does physical gold mean anything special to you? "just one of these current buzzwords" I think Amazon, Shale, Uber, AirBnB are real. The question is gold susceptible like say salt was. Great interview ! Please bring Dan Oliver back on again! Good to hear...humility and admitting not always right. Living thru the tough holding period myself waiting for when gold and miners would take off. A rare man who understands gold from all dimensions. Thank you . This guy is a theoretical story teller. Waste of time to anyone with few years of experience in market. He's classic reason why GDXJ exists. What does this even mean? "A theoretical story teller"? One of the reasons I am instinctively drawn to gold is the arrogant incoherence of those who despise and disparage it. Bet you can't back that statement up with facts Amit. The fact that I'm old and have gold leads me to the question "the future price of gold and therefore do I have enough it insure a life style I want to insure?" Video quality when the camera is on Grant is poor; while when on the interviewee is good. Why? is it me, or has the video quality gone down? Filming issue? Or deliberate? I also found this conversation invaluable. Thanks Grant and Dan. Early or Wrong on Gold?